Your tax bracket determines how much of your taxable income you must relinquish to the Internal Revenue Service (IRS) every year. As of 2015, according to Forbes, the IRS divides citizens into seven tax brackets, each representing an income range. Understanding how tax brackets work can help taxpayers understand how taxes are calculated. Each tax bracket is associated with a certain percentage point, which represents the portion of your income claimed by the IRS. Forbes cites 10, 15, 25, 28, 33, 35, and 36.9 percent as the graduated percentage points from lowest to highest income. In other words, the more money people earn, the more they pay in taxes. The tax bracket into which people fall depends on how they file taxes and the makeup of their household. For example, even though you and another person earn the same amount of money, you might fall into different tax brackets if the other person files as head of household and you file as a single individual. The percentage of money you pay changes based on the tax brackets into which your income falls. According to the IRS, your marginal tax bracket refers to the highest tax rate you must pay. For example, if a person earns $35,000 in 2015, his or her marginal tax bracket will be 15 percent, while an individual who earns $200,000 falls into the marginal tax bracket of 33 percent. The highest marginal tax bracket is reserved for those who earn more than $413,201 when filing as an individual. Knowing your marginal tax bracket helps you understand how your taxes are calculated, but you actually can fall into more than one tax bracket. This is because the IRS only assesses greater taxes on the income that falls within a particular bracket. In a graduate tax program, students learn how to calculate these numbers to benefit the taxpayer. As mentioned above, a person who falls into the marginal tax bracket of 15 percent does not have to pay 15 percent on every dollar he or she earns. Instead, the IRS calculates the tax using the 10 percent bracket for the first $9,225, then levies the 15 percent tax on the remaining income. In addition to taxing your income in separate tax brackets, the IRS adjusts the tax brackets based on each family’s filing status. According to the IRS, there are five filing statuses: single, married filing jointly, married filing separately, head of household, and qualifying widow or widower with dependent child. Forbes reports that in 2015, tax brackets will grow across all filing statuses. This might sound like bad news, but larger tax brackets are inversely correlated with tax rates. In other words, higher limits in the tax brackets means most taxpayers will keep more of their money. 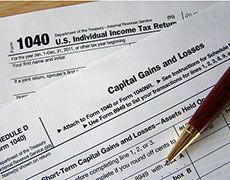 The IRS uses tax brackets to calculate how much income tax an individual or family must pay. Together with other factors, such as deductions and credits, tax brackets make it easier to understand how income influences income tax.